Pretty much everyone interested in dinosaurs, in the history of life, or in such matters as the evolution of intelligence and/or brain size, will be familiar with the various speculations on ‘humanoid dinosaurs’ that have made their way into the literature. 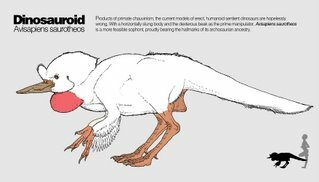 During the 1970s it became widely accepted that one group of Cretaceous theropods – the troodontids (known at the time as saurornithoidids) – were relatively big-brained, with encephalisation quotients overlapping those of modern birds and mammals. In reality, troodontids might therefore have been as ‘smart’ as bustards, emus or opossums. The notion that these dinosaurs were ‘big brained’ and therefore ‘intelligent’ seems to have given rise to a myth however: that these were really smart dinosaurs, approaching the anthropoid level in terms of their ability to solve problems and understand the world around them. At least one book on earth mysteries and the paranormal states that some dinosaurs were ‘probably as intelligent as primitive man’ – a quote almost certainly based on studies of troodontids. In Jurassic Park, the dromaeosaurids are intellectually on par with chimpanzees. 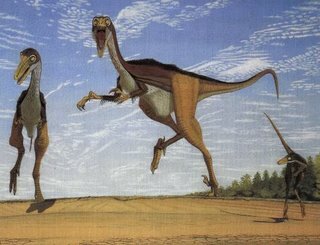 Inspired by new data on troodontid brain size, Carl Sagan speculated about intelligent dinosaurs in The Dragons of Eden (1977) and posed the question: what if non-avian dinosaurs hadn’t become extinct? If Cretaceous forms were already so ‘smart’, what would have happened given another 60-odd million years of evolution? His question seems to have inspired a number of science fiction stories that appeared soon afterwards. Among the most important data on troodontid brain size was that published by Dale Russell, then of the National Museum of Natural Sciences (Ottawa), and besides publishing several key studies on troodontid anatomy and functional morphology, in 1982 he did a rather peculiar thing. Co-operating with taxidermist and model maker Ron Séguin, he produced the article ‘Reconstruction of the small Cretaceous theropod Stenonychosaurus inequalis and a hypothetical dinosauroid’. 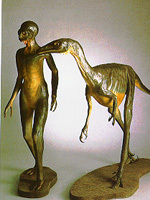 While part of the article discussed how a life-sized model Stenonychosaurus (presently regarded as a junior synonym of Troodon) was reconstructed and made, the rest was devoted to a thought experiment in which Russell & Séguin (1982) reconstructed a hypothetical ‘evolved’ troodontid that had reached an encephalisation quotient similar to that of humans. Most of us are familiar with the look of the finished product, dubbed the dinosauroid, but some of the decisions Russell & Séguin made in creating the creature have not been mentioned or discussed outside of their paper [adjacent Greg Paul painting, showing a group of troodontids, borrowed from here]. They reasoned that an enlarged brain would result in a shortened facial region, and they used the cranial proportions of a chick embryo as a guide. Based on the idea that troodontids had a reduced dentition compared to other theropods, and on the notion that big-brained primates have a reduced dentition compared to smaller-brained forms, they made the dinosauroid toothless. They further argued that a big-brained head would need to be supported directly over the body, and that a short neck and vertical human-like posture would evolve. The vertical posture meant goodbye to the tail (reduced to a stump in the dinosauroid), and the need to give birth to big-headed babies led them to imagine a broad, human-like pelvis. Dinosauroids were imagined to be viviparous, so the model is equipped with a navel. Because human legs obviously work well for humans, Russell & Séguin proposed that human-like legs would also work for a human-like dinosauroid, and they gave the creature plantigrade feet. Interestingly, they used tree kangaroos as a model, and the feet of the dinosauroid are not tridactyl and clawed as usually shown in drawings, but four-toed, with nails rather than claws, and with the two medial toes smaller than the lateral ones. All in all, the dinosauroid is disturbingly human-like and, I think, too human-like. While Russell & Séguin made efforts to justify their chain of logic, they may as well have looked at life restorations of hominids, and just ‘reptilised’ them a bit. Essentially the message is that the human body plan is the ‘best’ body plan for a big-brained tetrapod. But Russell & Séguin knew that they would be accused of this, and they ended their discussion by wondering if they had been directed by bias, or if the humanoid shape really would crop up convergently, as do so many other body shapes. Are they wrong, and would things have been different? Well, the last line of their article is: ‘We invite our colleagues to identify alternate solutions’ (p. 36). The reactions that palaeontologists have had to the dinosauroid have been mixed. Some have been fairly positive about it. David Norman (1985) considered the dinosauroid in a favourable light, concluding that ‘Such an idea is an obviously fanciful, though provocative thought’ (p. 55). On the same page, an illustration of the dinosauroid by John Sibbick (which looks a bit scarier than the Russell and Séguin model, and also differs from it in foot anatomy) is accompanied by a caption that is even more favourable. After listing the morphological changes required to turn a Cretaceous troodontid into a dinosauroid, it ends by stating that ‘given the right conditions, such changes would be quite feasible’. ‘Feasible’? Note that the captions in the book were not written by Norman, so he shouldn’t get the blame for that (I will refrain from saying who did write the captions). Another of David Norman’s books, the 1991 Dinosaur!, discusses the use of a real, live dinosauroid in the Granada television TV series that the book was written to accompany (Norman 1991). Played by a person in a suit (obviously), the dinosauroid from Dinosaur! 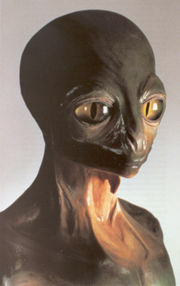 had a more reptilian look to it than Russell and Séguin’s model: it had far scalier-looking skin, snake-like ventral scales, and a vivid green and red colour scheme. The series concluded with the dinosauroid acting as narrator. Another positive interpretation of the dinosauroid came from Cristiano Dal Sasso (2004) in his Dinosaurs of Italy. He seems to have accepted Russell & Séguin’s idea as if it were universally agreed as likely, which it isn’t. Other palaeontologists have been negative however. At least one reviewer of Russell & Séguin’s paper wrote that ‘I do not see much value in the extremely speculative ‘dinosauroid’ discussion’ (Russell 1987, p. 127). In Predatory Dinosaurs of the World, Greg Paul (1988) found the dinosauroid to be ‘suspiciously human’, and he argued that – were theropods to evolve big brains and ‘intelligence’ – we should instead expect them to retain horizontal bodies and long tails. Theropod expert Tom Holtz has stated much the same, and so far as I can tell from discussion, most dinosaur workers feel this way too. There really isn’t any reason to think that big-brained dinosaurs would have evolved in the first place (recall that even ‘big-brained’ Troodon was, at best, on par with ostriches and opossums), and even if they had, there is also no reason to think that they would have ended up looking like scaly people (or feathery people, given that we now know that troodontids were feathered). You write "... brains proportionally as big as, or bigger than, those of hominids are found in some birds and fish (that's right: humans do NOT have the proportionally biggest brains)." Mike, the fish I always have in mind when talking about brain size is the Elephantnose fish Gnathonemus petersii (though it still often goes by a younger generic name, Morymus), a bony-tongued fish from the Lower Niger Basin. It is an electrogenic fish, generating a weak electric field that is apparently used in navigation, sensing its surroundings, and in communication (the fish use eletrical pulses to send signals to other elephantnoses). Its brain is proportionally bigger than that of humans. This fact is one of several indicating that, in cases, big brains evolved where species indulge in a particularly complex sensory interpretation of their environment. After all, there is no indication (so far as I know) that elephantnoses are particularly 'smart'. This may explain why some cetaceans have such big brains. As for birds, the brains of parrots overlap with those of orangutans, chimps and gorillas (just to clarify, the living great apes are members of Hominidae: this group name isn't restricted to humans). According to Andrew Iwaniuk “Humans have these really big brains, but guess what, parrots have really big brains too. In fact, if you overlay a graph of brain size to body mass for parrots on top of one for non-human primates, they sit in a perfect line”. I don't think there are any parrots that overlap the brain : body size ratio of Homo, but they certainly overlap with members of Hominidae. Parrots are also strikingly hominid-like in the anatomy of the neocortex, apparently. Well, I am stunned. I need to go and find out about your big-brained fish. To be totally clear, you're not just saying that it has a higher EQ than humans, but (which is saying more) the brain is larger as a simple linear proportion of body mass than in humans? Astonishing. Aren't there some small primates with a larger brain : body ratio than us, too? Or was that just the frontal lobes? BTW, the commonly used generic name of the elephantnose fish is Mormyrus; maybe google for that or for Mormyridae. I f$%*ing hate the dinosauroid. It must die! I found your post very interesting. I have blogged about it on my own blog, and linked it here. Hope it generates more traffic for you! You're certainly right that this is more feasible, but I wonder if perhaps you haven't made your creature almost as gratuitously avian as the original is gratuitously humanoid. Especially, why in the would a beak be his prime manipulator? Oral manipulation is, frankly, quite clumsy. Quadrupeds have no choice, and birds make do with it because THEY have sacrificed their forelimbs to wings, but he's still got those nice, long arms with digits at the end of them. Doesn't it seem quite likely that a being intelligent enough to make very advanced use of tools would adapt those to dexterity rather than just let them hang around? The dinosauroids ancestors didn't die out - they moved to Venus and evolved into Treens (Treenosaurus dan darei)! Why is this theory so far fetched? Homo Sapiens are said to have evolved in a mere 2 million years. Dinosauriod would have had over 65 million years to evolve. Think how far human civilization would advance in 65 million years. Think how far we as a civilization have advanced in the last 200 years! Dinosauriod would have had no competion in nature and could have evoloved efficently and quickly over that time span. The only question that remains is where are they today? Dead, Alive, underground, invisible, shape shifting, space (hahaha for the previous four options)? Superior intelligence is probably correlated to both brain to body ratio *and* absolute brain size. As brain to body ratio might be constrained by body size... humans might indeed be at an optimal brain size * brain to body size occurrence. Fact is, the human body plan is the only one known to have produced technology level intelligence, so expecting convergence into our form is not unreasonable. Hi. I agree with the people who say the avi-thing is too bird -like. Well done you people. We can't let Darren get away with his propaganda! I think it's small-minded to say an advanced intelligent Dino would look like a bird. We know BIRDS look like birds, and that birds evolved from a type of dinosaur very like those which we are considering for the civilsed Dino. But to have an advanced Dino look...just like a bird, is convergent evolution, or parallel evolution, of the most ridiculous kind! And there's no need for it. Would that species be pecking about in bushes? No. They'd have tools, need to stand up for good vision and well-balanced weight, etc. All the evolutionary arguments for how WE look like we do could be applied to them. Oh -- and critics seem to really hate the upright-stance aspect. WELL...It works for us. Chimps can't walk for miles or run marathons while having good vision all around, but we can. 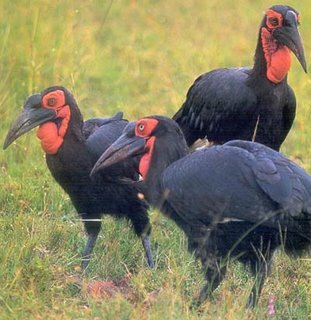 LJV: with respect, you're totally missing the point… this being that troodontids were so bird-like to begin with that there just isn't any reason to think that they might somehow have evolved an ape-like or human-like shape. As I've said on many occasions, we owe our body shape to our specific evolutionary history. If big brains, sentience and tool use were to evolve in bipedal maniraptoran dinosaurs, it's wise to assume that they would have remained bipedal maniraptoran dinosaurs. You're assuming that the human route is the 'best' one to follow; I think that's arguable and not likely correct. You may be stuck on the fact that Dinosaurid is a 'ape-like' (your words) or human-like shape. We humans don't look all that ape-like any more. We've definately gone a little sideways--for all of the evolutionary reasons that both you and I know. If we are talking about convergent evolution, then making the Dinosauroid 'human-like' is what it's all about. But we are not talking anthropomorphising, but speculating that we might be a good design for an intelligent civilised creature. Our success does kind of suggest we might be! I do agree that the Dinosauroid might very well be 'too human' in detail, but in general overall principle, not. The McLoughlin Bioparaptor gone more upright might be nearer.